The amount of resources that you get depends on the size of your resource buildings. It is important to build up your warehouse to make sure that you don't lose the resources that don't fit. At the top right of your screen you can see how many resources your warehouse can hold, and how many you currently have. The number on the right shows how many of each resources can be stored. In this example, a maximum of 400000 of each resource can be stored. The numbers to the left of that show the resource amounts that are stored right now (53313 wood, 222435 clay and 21519 iron). 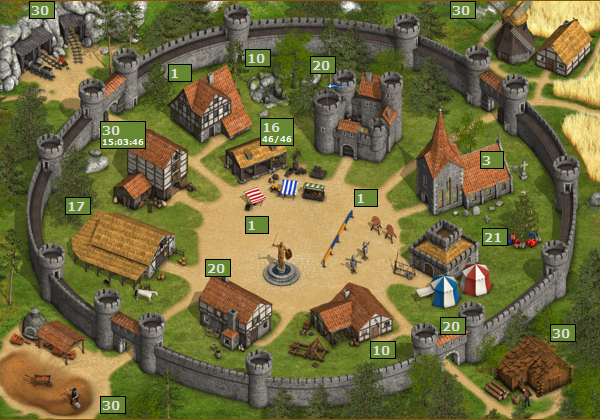 In addition to recruiting troops, there are also other ways to help protect your village and defend your resources in the early stages of the game. One way to protect your resources is to build up your hiding place. The bigger the hiding place, the more resources are safe from attackers. Another good deterrent is to build a wall (Level 1 barracks needed). The higher your wall level the stronger your village's basic defense will be. This means your enemies will suffer higher losses when they attack villages with higher wall levels. If you find you have excess resources, you might want to consider building a market. (Level 3 headquarters and level 2 warehouse needed). In the marketplace, you can see what your neighbors are offering and trade away resources you don't want. You can also create your own offers. Don't make the mistake of concentrating too much on creating your first nobleman. It might sound logical to try to get a second village as quickly as possible but it does not help you if you can't defend your villages. If you only concentrate on the noblemen you are an easy target, and also a well-liked target as bigger players would love to have a village that is already on the way to being ready to produce noblemen. By the time attacks start coming in, it's usually too late. The security phase can take some time, but it will usually pay off, as you can always use those defensive troops in the later game. Once you have a good amount of defensive troops - something like 1200 spears and 1200 swords - you can start thinking about a nobleman. 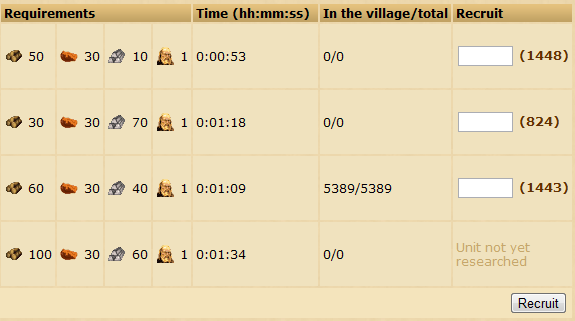 The village overview gives you a lot of information about your village on one page. You can see the size of your buildings, your current resource production, your troops and troop movements. You can switch between the classical and the graphical village overview. The classical overview is a big advantage when you are on a slow internet connection. If you have a premium account you will get a lot of very useful added information like the production in your buildings, the amount of merchants and the time when your warehouse will be full. Below is a labelled village overview that shows what the different buildings look like. You can rename your village by going to the headquarters. On the bottom left under the buildings you see your currents village name, which you can edit and save with "change". If you want to construct a building, you have to click on the village headquarters and then click on "expansion to level X". You need the specified amount of wood, clay and iron. The exact amount depends on the kind of building and its level. The bigger you want to construct the building, the more resources are needed for the next level. 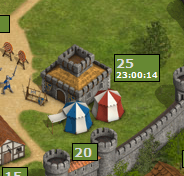 To recruit troops, you first need to click on your Barracks. Then, simply type in the number of desired troops and click Recruit. This page was last modified on 11 May 2018, at 22:41.